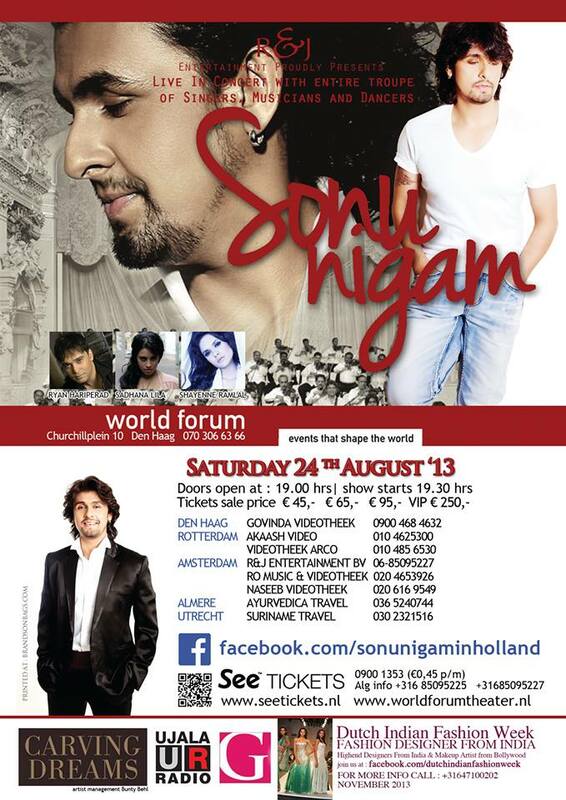 Sadhana Lila will be performing in the World Forum Theater on Saturday the 24th of August during the Sonu Nigam live in concert event in the Hague. Sonu is a leading playback singer and has sung innumerable songs in many languages other than Hindi, like English, Kannada, Assamese, Oriya, Bhojpuri, Malayalam, Bengali, Telugu, Urdu, Punjabi, Tamil and Nepali. He began singing with his father when only three years of age. He began with mostly singing Mohammed Rafi‘s songs accompanying his father in stage performances. He took part in different music contests successfully in his growing up years. When 19, he shifted base to Mumbai to pursue his singing career in Bollywood seriously. He trained under Ustad Gulam Mustafa Khan meanwhile. He had to struggle in his initial years singing over Rafi songs. Gulshan Kumar of T-Series released his album on Md. Rafi tracks. But Sonu had still to break out of his image of ‘Rafi clone’. He continued lending his voice to radio commercials. At this point, the music reality show Sa Re Ga Ma happened. Sonu became the first host of the show airing in 1995 in Zee TV. Over the time the show became popular and his prospects looked brighter. He recorded ‘Accha Sila Diya’ for the album, Bewafa Sanam in 1995. But he arrived only with the soulful track from Border (1997) ‘Sandese Aate Hai…’ and his 1999 album ‘Deewana’ was another milestone. The album comprising of romantic sings was a huge hit and heightened the all new Sonu. This image was furthered by the Nadeem Shravan composed ‘Yeh Dil Deewana’ from the movie Pardes. And thus arose a distinctive voice that would go on to dominate the playback singing in Bollywood for a long time to come. He lent his voice to many movies which came out with hit music, some of the notable ones include, Border (1997), Dil Se…(1998), Soldier (1998), Sarfarosh (1999), Hello Brother (1999), Taal (1999), Dil Chahta Hai (2001), Kabhi Khushi Kabhie Gam (2001), Saathiya (2002), Ishq Vishk (2003), Kal Ho Naa Ho (2003), Main Hoon Na (2004), Hum Tum (2004), Veer Zaara (2004), Parineeta (2005), Paheli (2005), Fanaa (2006), Lage Raho Munnabhai (2006), Jab We Met (2007), Om Shanti Om (2007), Ghajini (2008), 3 Idiots (2009), Desi Boyz (2011), Agneepath (2012), Gangs of Wasseypur (2012). Other than singing for films, he has released successful albums like Jaan, Chanda Ki Doli, Mausam, Kismat and few others including some devotional ones. Sonu hosted Radio programme in Radiocity(91.9 FM)’s Life Ki Dhun in 2006. He continued his stint in television with Sa Re Ga Ma Lil Champs International (2007) as a judge, hosted Kisme Kitna Hai Dum (2002), judged Indian Idol, Season 1 to Season 4 also Amul’s Star Voice of India (2007). He even dubbed for the character of Aladdin in the Hindi version. 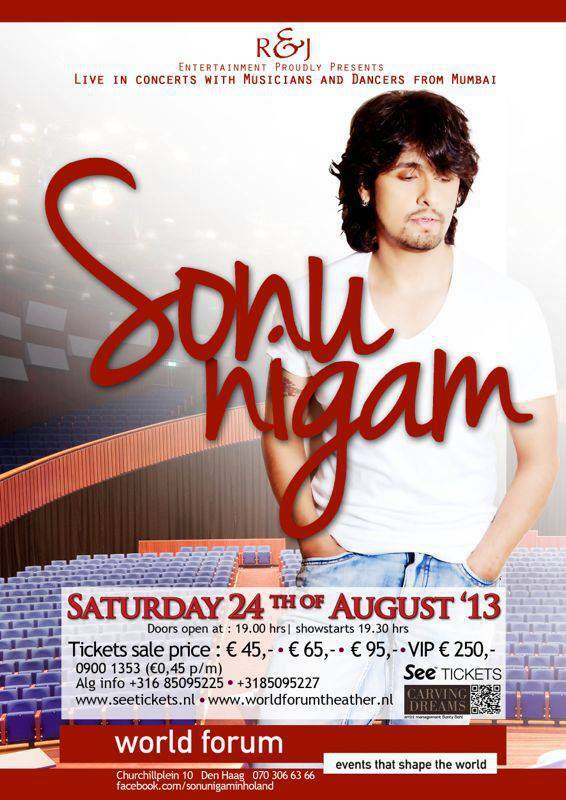 Sonu has traveled and performed in several global concerts. He joined Asha Bhonsle, Kailash Kher and Kunal Ganjawala in ‘The Incredibles’ tour, gave live performances in Canada and Germany for his concert, ‘Simply Sonu’, joined Sunidhi Chauhan in ‘The Explosion 2009’ touring United States. Other than this, he performed in United Kingdom, Belgium, Spain, New Zealand, Russia, Singapore, Saudi Arabia, West Indies, South Africa, Afghanistan, Bangladesh, Holland, France, Malaysia, Pakistan, Thailand, Mauritius, Indonesia and Nepal. Dit bericht werd geplaatst in PUBLICATIES en getagged met bollywood, Dancer, Dancers, gig, Hindi, HIndu, holland, india, Indian, Jonita Gandhi, Live in concert, netherlands, Performance, Ryan Haripersad, Shayenne Ramlal, show, Shruthi Menon, singer, songwriter, Sonu Nigam, the hague, World Forum. Maak dit favoriet permalink.